Today's harvest is 39 polls in 18 states. In most states the winner didn't change, but we have motion in two key states. The most recent poll in Ohio, Zogby's tracking poll, puts Kerry a tad ahead there, 46% to 45%, well within the margin of error. Other Ohio polls are mixed. Rasmussen's tracking poll puts Bush 4% ahead but the LA Times poll puts Kerry 4% ahead. Let's call Ohio a tie. Which way it goes will almost assuredly depend on the turnout Tuesday, especially among younger voters. Could OSU elect the next president? It is not out of the question. The other state where we have a change is Michigan. According to the latest poll there (Zogby's tracking poll) Bush and Kerry are tied at 47% each. However, two other polls (Rasmussen and Mitchell Research put Kerry ahead by 6% and 1%, respectively). 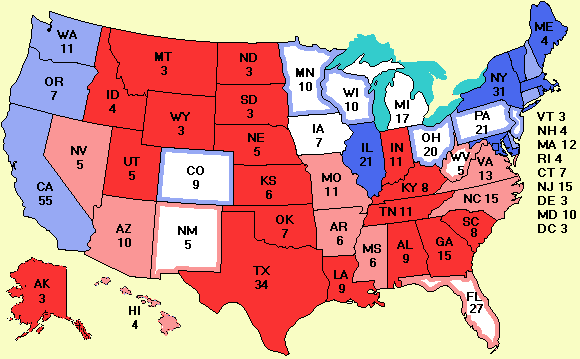 All in all, by gaining Ohio and having Michigan be tied, Kerry makes a net gain and now leads in the electoral college, but neither candidate has the required 270 electoral votes it takes to win. Ellis Henican had a very insightful column yesterday that is relevant to the Rasmussen poll I cited yesterday in which 1/3 of the voters weren't sure the election would be fair. Henican said the banks execute millions of ATM transactions every day, giving the customer a printed receipt if requested, and get them all right all the time. Not a margin of 1%, no recounts, but 100% right all the time. Why can't we make a voting system that is 100% right all the time? It would seem to me that the right way to do this would be a touch screen machine that asks the voter to make choices for the various offices in a language chosen by the voter (with audio output if desired), and when all done prints a paper ballot the voter can personally verify and deposit in the ballot box. The computer total would be available instantly after the polls close but in the event of a challenge, these paper ballots could be optically scanned or even hand counted. I can't believe a system like this is infeasible and it would certainly help restore faith in the electoral process. But the problems aren't only technological. There may be deeper forces at work. Today's New York Times reports that tens of thousands of absentee ballots in Florida's heavily Democratic Broward County have mysteriously vanished. The county says it mailed them but the post office says it never got them. Today's Washington Post has an excellent story dealing with the issue of whether the polls are accurate. The basic problem is that the vast majority of people refuse to participate, so the sample is no longer random. Surveying mostly elderly, lonely, or bored people can bias the results. The Post reports that one caller apparently was so fed up with telemarketeers and pollsters that he attached a device to the telephone that made such a loud noise it damaged the pollster's eardrum. Even response rates for exit polls on election day have dropped to 50%. This information goes a long way to explaining why the polls are so erratic this year. But in all fairness, the final 2000 polls weren't so hot either. Eleven of the 15 national polls just before the election predicted Bush would win the popular vote by a margin of 2% to 6%. Ultimately, Gore won it by 0.5%. Legal news: A U.S. District Court judge in Cleveland killed an effort by the GOP to remove tens of thousands of Ohio voters, largely minorities from the voter rolls, but a judge in Cincinnati has granted a temporary restraining order in a related case. See Rick Hasen's Election Law blog for more on these stories. Stupidity news: One of Kerry's electors in Ohio, Rep. Sherrod Brown, is a congressman. Unfortunately, the constitution forbids federal office holders from being electors. It is possible that if Kerry wins Ohio, Brown's right to cast an electoral vote will be challenged in court. Whoever picked a constitutionally ineligible elector needs to get his or her mental software upgraded to the latest release. Sleeper news: A Rasmussen poll taken Oct. 26 in Arizona puts Libertarian party candidate Michael Badnarik at 3%. When the pollsters actually ask about him, he does surprisingly well. He might end up canceling out the Nader factor by appealing to disgruntled Republicans who support a balanced budget and small government and are appalled by the current deficit and power the Patriot Act gives the government to snoop on people's lives. How political involved is your college or alma mater? Take a look at university hits page. Note that there is no correction for size here, just the raw hit count. Earlier I pointed out a number of prominent conservatives supporting Kerry, such as President Eisenhower's son, John, a lifelong Republican. I said that if any prominent liberals supported Bush I would mention them, too. OK, I'll keep my promise. Several readers pointed out that former NYC mayor Ed Koch, has endorsed Bush. Some people also pointed out Sen. Zell Miller, too, but he is certainly not a liberal and has been voting with the Republicans in the Senate for years, so he is barely even a Democrat. Several people commented that Hawaii is colored weak Bush when it should be barely Bush. This is simply because Hawaii doesn't have enough pixels. If you have any spare pixels, please donate them to Hawaii.